Maryland Gov. Larry Hogan temporarily moving his office from the state capital, Annapolis, to Baltimore on Tuesday after rioting and fires broke out in the city. Hogan spent a portion of the morning surveying the scene at a West Baltimore intersection that hours earlier had been littered with burning cars, a smashed police vehicle, broken glass and thick plumes of smoke billowing from a looted convenience store. Hogan shook the hands of people who had shown up early to help sweep the streets after rioting erupted in the city Monday, hours after the funeral for Freddie Gray. The 25-year-old died of a spinal injury days after being taken into police custody. 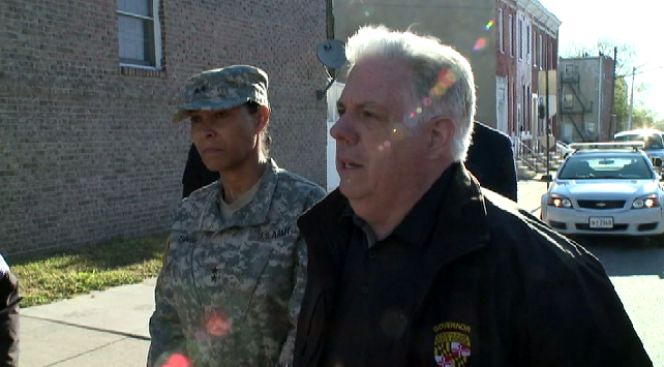 "We're not going to leave the city unprotected.," Hogan said. He added that he's called in hundreds of state troopers and potentially thousands of National Guardsmen to help secure the city. "The city is safer than it was before, and we're going to continue to build that presence all day,' Hogan said.